Naturally low in fat and packed with protein and healthy omega-3 fats, seafood is a perfect choice for fresh meals that fit well into a diabetes meal plan. 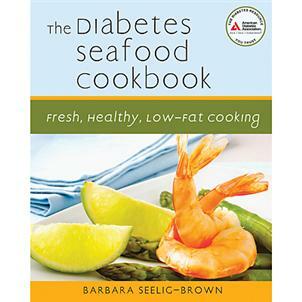 Unfortunately, most seafood cookbooks on the market take what’s naturally a healthy ingredient and add heavy cream sauces, fatty oils, or fried batters. The results are unhealthy meals packed with fat and cholesterol that could potentially wreck a diabetes self-care plan. With The Diabetes Seafood Cookbook, author Barbara Seelig-Brown has put together over 100 meals that deliver seafood’s nutrition-dense benefits without skimping on taste. Brown has refined the art of coaxing delicious meals from healthy ingredients, while keeping the process simple and approachable. Very attractive book. Delicious recipes! I love the recipes and the "cook's tips". The recipes are easy to follow--My goal is to try every recipe in this book. The Grilled Salmon Steak with Celery Root and Parsley; and the White Bean Soup are delicious.